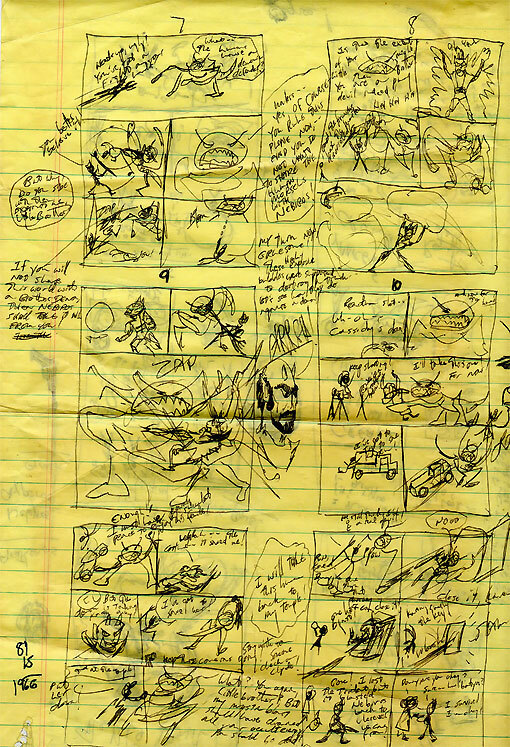 We’ve got an incredibly rare opportunity today to show a never-before-published Blue Devil piece, and witness behind-the-scenes in the development of a comic book. 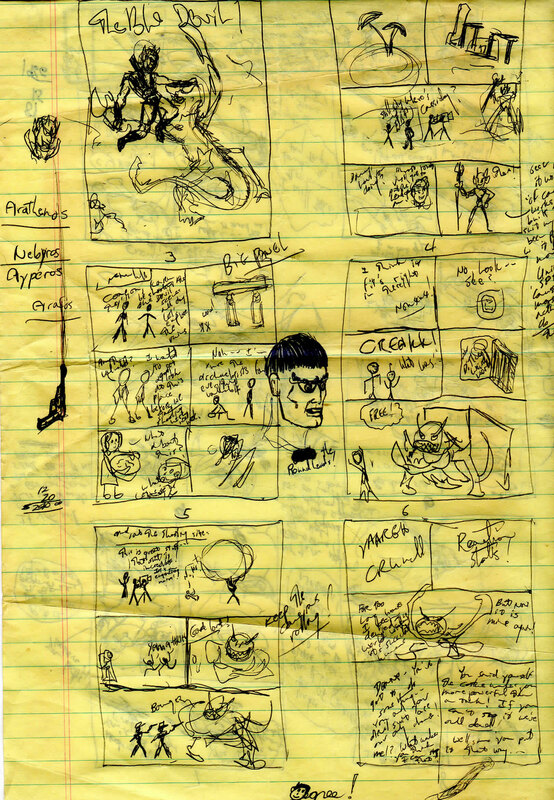 Gary Cohn, co-creator and co-writer of DC’s Blue Devil, recently unearthed his original sketched thumbnails for Blue Devil #1 (June 1984). These were thumbnails he drew himself as they plotted the first issue. Gary was kind enough to send scans of these thumbnails for ONCE UPON A GEEK readers to enjoy! Thanks Gary! If you are familiar with Blue Devil #1, then you’ll be able to tell these twelve thumbnails encapsulate nearly the entire story from that issue. Click the images below to enlarge. To demonstrate how thumbnails can be used, I’ve selected a couple sketched pages to compare to the final product. Below are the third and fourth pages from the first sheet above. 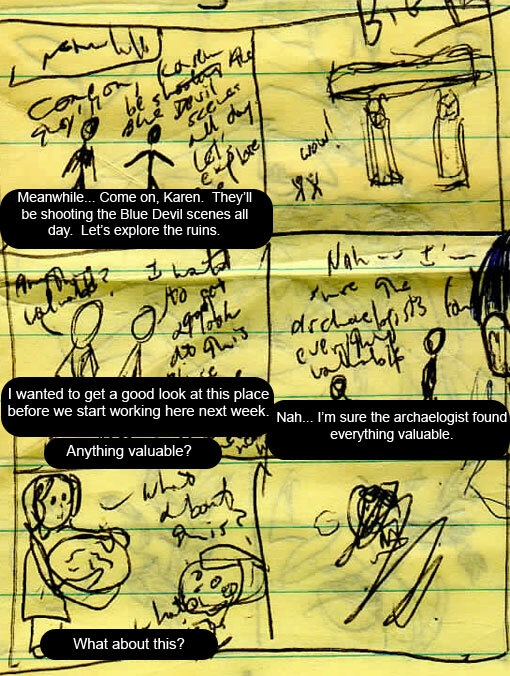 I’ve also transcribed some of Gary’s handwriting in the thumbnails. 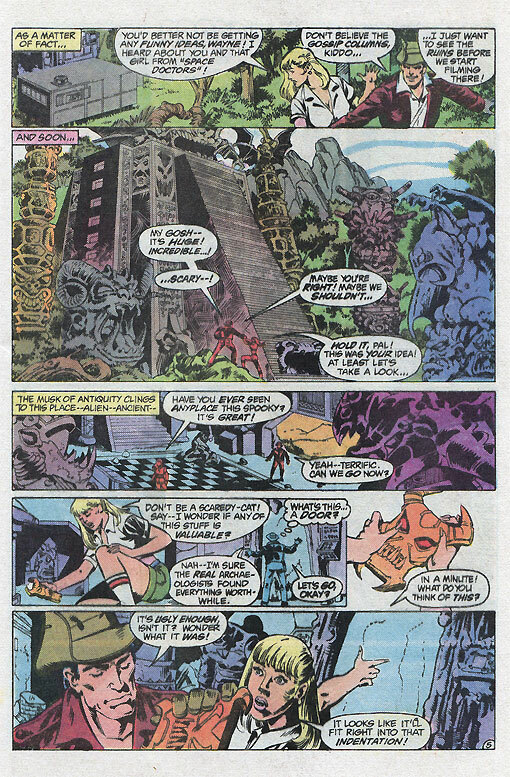 Below is the same page, but in its final form as drawn by Paris Cullins. You can see the concepts stay the same, even if the panels and dialogue change. Here is the thumbnail for the next page. I LOVE the direction given to the artist to draw a “Ditko Weird World”. This of course is referencing the great artist Steve Ditko, famous for his work on Spider-Man and Doctor Strange. Below you can see how the final page played out. Again, the concepts stay the same, even if the panels and dialogue change. 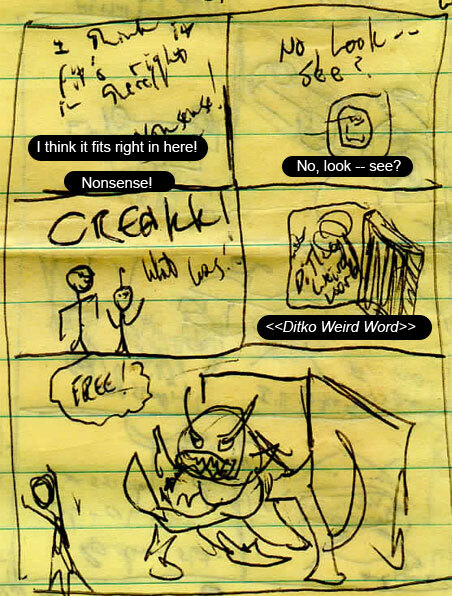 Now you see how rough thumbnails can translate into your favorite comics. Additionally, we got to examine a never-before-seen crucial step in the creation of Blue Devil. My sincerest thanks to Gary Cohn for supplying us with scans of these wonderful breakdowns! For more information from Gary Cohn about Blue Devil, be sure to check out the audio interview he and Dan Mishkin gave to ONCE UPON A GEEK a while back. Click here to hear that interview.